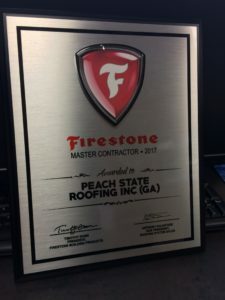 Peach State Roofing was recently awarded for outstanding performance and commitment in regards to the quality installations of Firestone Red Shield warranted roof systems. Peach State Roofing earned the distinction of 2017 Firestone Master Contractor for work and projects completed in the 2016 year. According to Firestone, this year holds a special distinction, as 2017 commemorates the 30th anniversary of the Master Contractor Program. Peach State Roofing has found it a a pleasure working with the entire Firestone Building Products team around the country and all of the 15 national offices of Peach State Roofing have enjoyed in supporting projects to help the company as a whole achieve this Master Contractor award. An award plaque was recently delivered to commemorate this high roofing industry distinction.